If you are travelling to Cape Town for an MEI Conference, it is a great opportunity to stay on and explore the diverse and beautiful regions of South Africa. We at MEI have travelled extensively in South Africa, and have shared our experiences on the blog. Cape Town is in one of the most beautiful provinces, the Western Cape, but there are equally beautiful areas, and one of the most interesting is KwaZulu-Natal, not only for its wonderful coastline, but for the impressive Drakensberg Mountains and its fascinating Battlefields area. Barbara and I spent a week there in 2006, pre-blog days, so rather belatedly I am sharing our experiences now, as I would highly recommend this visit after a Cape Town conference. We flew from Cape Town to Durban, rented a car and drove to the Southern Drakensberg mountains, where we based ourselves near the town of Underberg. In retrospect we maybe should have based ourselves at the stunning Cathedral Peak Hotel in the heart of the Drakensberg, a hiker's paradise, and close to the Battlefields. From Cathedral Peak it is an easy drive down into the heart of Zululand, which saw some bloody battles in the Anglo-Boer War, and of course during the Anglo-Zulu war, but prior to these wars, the Boers, trekking from British oppression in the Cape, encountered Zulu armies when trying to head towards the coast. At Blood River a replica laager of 64 life-size bronze wagons stands on the site where on December 16th, 1838, a 464 man-strong Boer commando defeated a Zulu army of between 15,000 and 20,000. The Boers made a solemn vow to God that should they survive the battle, Afrikaners would hold the day sacred in perpetuity. 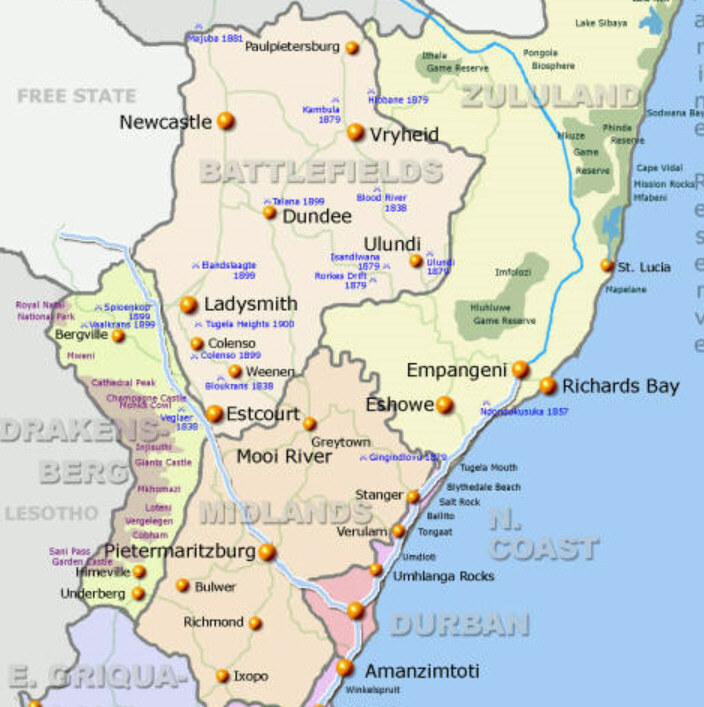 3000 Zulu, armed only with spears, were killed, and no Boers died, leading to the myth that the Afrikaners were God’s chosen people. The most humiliating defeat in British military history took place on January 22nd 1879, when virtually an entire force of 1700 men was obliterated at Isandlwana by Zulu warriors armed with spears. The battlefield remains unspoiled and unchanged, apart from the graves of those who died. 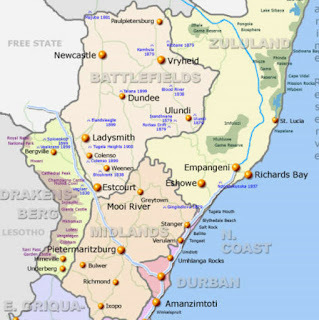 Inspired by their victory, 4000 Zulus, part of a reserve force, launched an attack on the mission station at Rorke’s Drift, across the Buffalo River in Natal. Of the contingent of 139 men at Rorke’s Drift, 35 were seriously ill. The battle raged through the night, until the Zulus retreated at dawn. Only 17 British soldiers died, and 11 VCs were awarded, more than any other battle in history. Perhaps the highlight of our visit to KwaZulu-Natal was the journey into Lesotho from Underberg, via the Sani Pass, the only road from KwaZulu-Natal into Lesotho, which twists to the top of the escarpment up to the highest point on Southern Africa reachable on wheels. We were in a convoy, with an experienced driver and guide, the road being negotiable only by 4-wheel drive vehicles. So, another trip for you to think about, just one of many unique experiences to enjoy in this amazing country.